I’ve added Claude Chabrol’s interpretation of Madame Bovary to my Lovefilm list. I am very choosy the films that I watch. I’ve yet to see a Chabrol film that hasn’t provoked a powerful reaction. He is a first-rate artist. 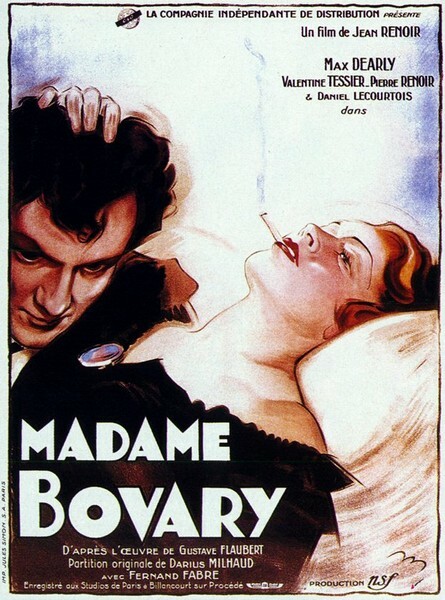 While mooching on the web I came across the poster below for Jean Renoir’s (another inspiring director) Madame Bovary. My first reaction was ‘Perfect! Tony Curtis is the perfect Rodolphe Boulanger.’ Don’t you think? Curtis (RIP) has the right balance of cheesiness and charm to pull off oily Rodolphe. Except that isn’t Tony Curtis in the picture. I think it is Daniel Lecourtois, who played Leon in this version of the film. This entry was posted in Claude Chabrol, Gustave Flaubert by Anthony. Bookmark the permalink. >Curtis would have made a good Rodolphe, but sadly not. Clive Owen I can see, but does Clooney have sufficient cheesiness?